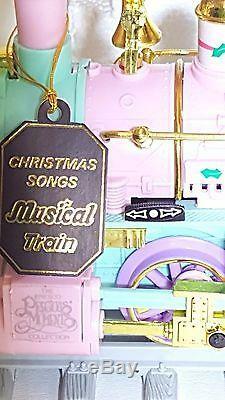 The Cadillac of girls trains, a collectible pretty pink, mint & lavender 1995 Precious Moments train. A perfect gift for your daughter, niece or grandchild! Brand: Enesco / New Bright / Precious Moments. Locomotive Engine - 12"L x 6"H x 3.75W. Coal car - 7.5"L x 4.25"H x 3.75W. Passenger car (1996)- 11.25"L x 4.5"H x 3.75W. Cargo car (1997)- 10.5"L x 4"H x 3.75W. Caboose - 9"L x 5"H x 3.75W. Forward, Reverse, Headlight, Train Sounds, Mute Option. 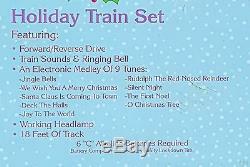 9 Holiday Melody of Tunes. We wish You a Merry Christmas. Rudolph the Red Nosed Reindeer. Requires 6 C batteries, included. Precious Moments Sugar Town Express Train Sounds - YouTube. Video will open in a new window. Train Holiday Music Video (3 of the 9 tunes) & shows engine working. Precious Moments Sugar Town Express 3 Christmas tunes - YouTube. The item "Girls Precious Moments Christmas Holiday Train Set Sugar Town Express with Video" is in sale since Thursday, June 30, 2016. This item is in the category "Collectibles\Decorative Collectibles\Decorative Collectible Brands\Precious Moments\Figurines\Christmas". The seller is "sgw162" and is located in San Dimas, California.